The cab driver with the Ph.D. and the lawyer with the minimum-wage office cleaner job have this in common: They are among 1 million immigrants who earned degrees overseas but are working low wage jobs in the U.S. due to low English proficiency, credential evaluation-validation, and other barriers. It’s nothing new among immigrant professionals in the U.S., said Dayana Cabeza, a career coach who was raised in Spain and Venezuela, and specializes in career orientation and transition in the United States. Research, networking, and the flexibility to “reinvent yourself,” are key requirements to finding a place in the professional workforce, she explained. Dayana will share her views with LVA students in “Job Searching Strategies and Reinvention for Professionals” a student support workshop offered next month. Page 2. If you’ve never examined Perrine Robinson-Geller’s unique collection of up to 300 age-appropriate books for adult learners, you’re in for a treat. See Page 2 for details on Perrine’s one-of-a-kind tutor support workshop next month. Kathy and Geneiva are about as close as two sisters can get. They live in the same building, share family meals, and study together with an LVA tutor. And for years, so were they. But that’s changing for Kathy and Geneiva, two sisters who share a love of church, a love of cooking, and, after two years of study with the same tutor, a love of reading. But it took time. And it started small, when their LVA tutor, Patricia, showed the ladies how to obtain a library card. It was an important step in their tutor’s plan and one that still brings smiles to the sisters’ faces. Each enjoys attending church and reading spiritual and devotional books. “I like to read books by Joel Osteen and Joyce Meyer,” said Geneiva. Kathy favors guided reading, working with her tutor to sound out words. “Every once in a while I give myself a challenge and also try to read short stories,” she said. 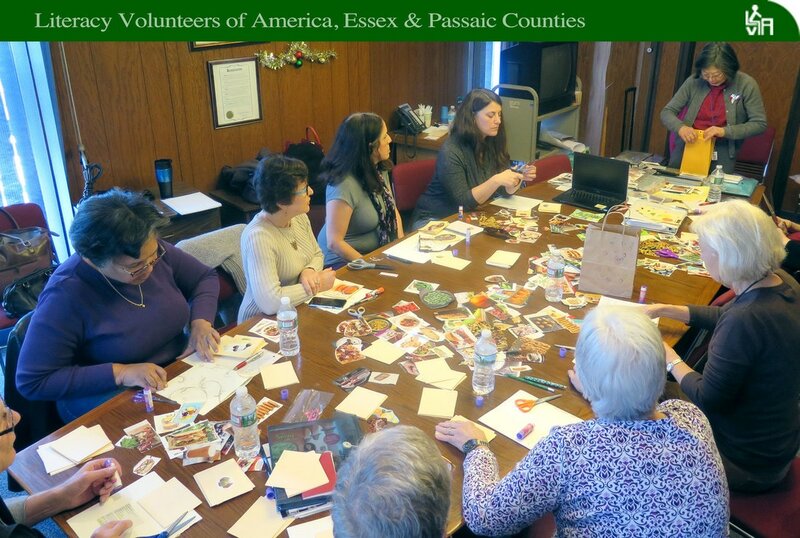 One in every four adults in Essex and Passaic Counties struggles to read and write English, according to federal statistics. About a third of adults with less than a high school diploma are not in the work force and many live in poverty. Geneiva’s goals include earning a high school diploma. Kathy wants to help her grandson, Javel, age 3, with school. When they’re not studying, the sisters, who live in the same building, enjoy telling stories of their family meals together. Geneiva’s specialty is spaghetti with Italian sausage while Kathy’s favorite cuisine is collard greens, macaroni and cheese and turkey wings. “One time I made a ham for Christmas,” Kathy said. “It wasn’t very good,” Geneiva added, as they erupted into laughter. 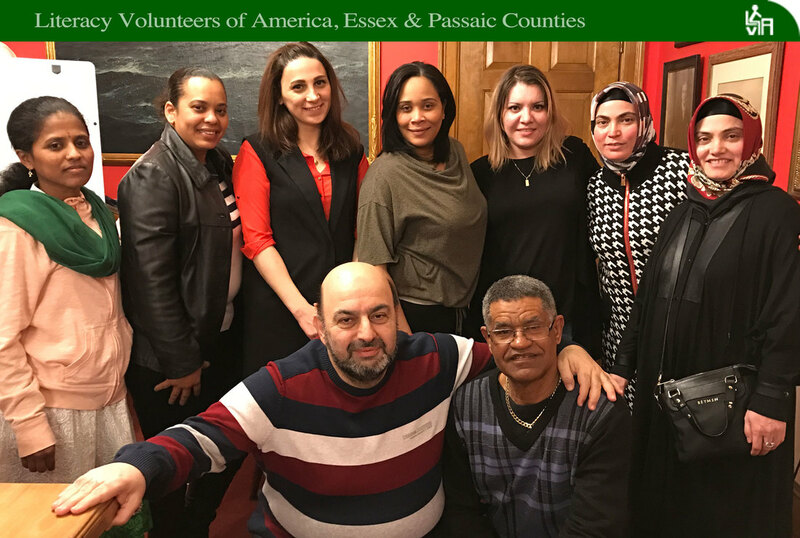 The Lighthouse for Asylees welcomed its first group of individuals who have been granted asylum in the United States to the church of the Incarnation in Jersey City. JERSEY CITY -- Tucked away in the attic of a Storms Avenue church, four beds are positioned in each corner of the room. Four men live together in the space and a woman lives directly below them. Together, they share a furnished kitchen, dining room, and living room complete with a row of computers where they often spend time talking to their families, who are thousands of miles away. For some, sharing a bedroom with three other men isn't ideal, but for 26-year-old Abu Kassim, his room is more than just a place he sleeps. Kassim, who is from Ethiopia, came to the United States about 18 months ago seeking asylum. "I don't have any problem," he says with a smile. "We have everything." Kassim is one of the first five asylees to live at the Church of the Incarnation's "Lighthouse." The Rev. Deacon Jill Singleton first envisioned "The Lighthouse" after visiting ICE detainees at the Hudson County jail. Many spent months without visitors and had no living plans once they were finally released, she said. 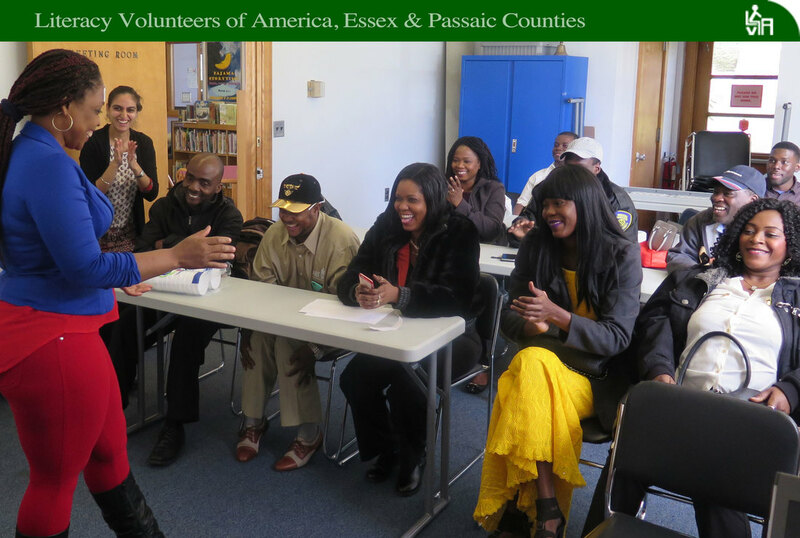 The church partnered with First Friends of New York and New Jersey to create a transitional home for those who left their war torn and violence stricken homelands for protection in the United States. Those asylees come here with no criminal history. If it’s true that the themes that run through one's life best reflect the values one treasures, then there are several that reveal much about tutor Robin Furrey. Her love of travel and her aid to others have been well-documented. and camping trip from her New Jersey home to Alaska in a Pontiac LeMans. Six years later she found herself in rural Guatemala, a Peace Corps volunteer with a forestry degree, determined to help indigenous villagers reforest their land in order to support a project that brought potable water to their remote communities. Her work commute was grueling: She rode up long, steep hillsides on a horse with a wooden saddle. Later, after a career change landed her a position as a computer programmer in a Bloomfield petrochemical engineering firm, she volunteered for an 8-year assignment to Venezuela. Unfortunately, the assignment ended 13 months later after oil prices plummeted. A New Jersey native, Robin has long loved the outdoors. “We always camped when I was growing up,” she said. “My family never stayed in hotels.” From a young age, Robin wanted to be a farmer. She attended the University of Connecticut, well-known for its school of agriculture, and majored in forestry and wildlife management. “Farming may not be a realistic choice for a girl from New Jersey,” she said. Skilled in math, Robin trained to become a computer programmer. She was hired by a Bloomfield petrochemical engineering firm where she met manager Ted Furrey, her future husband. They have three grown children. Robin retired from a career as an IT manager. She and Ted joined LVA together and now log plenty of monthly hours as tutors of small ESL groups and contributors to LVA’s English-Spanish Language Exchange. Sometimes gifts come in pairs. 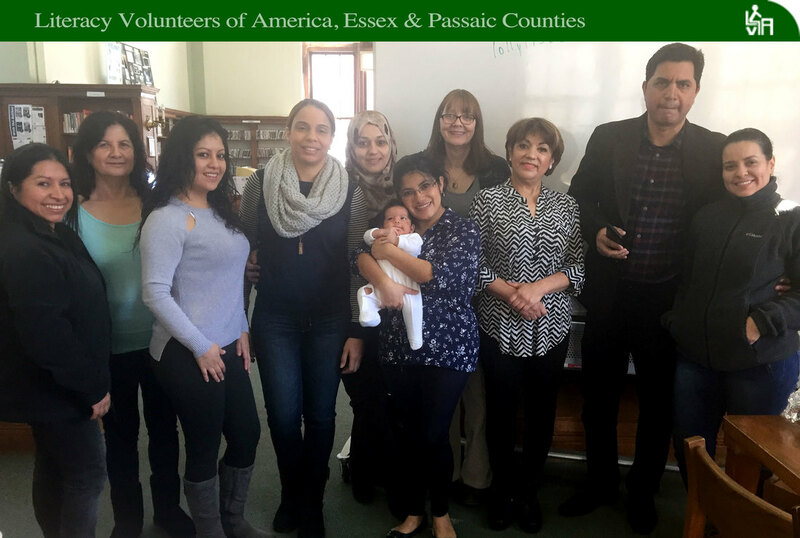 Last month we wrapped up another round of 10 and 12-week-long, state-funded ESOL classes with our hosts in four locations: the Hilton Branch of the Maplewood Memorial Library, the Bellevue Avenue Branch of the Montclair Public Library, the Reid Memorial Library of the Passaic Public Library, and the Southside Branch Library of the Paterson Public Library. 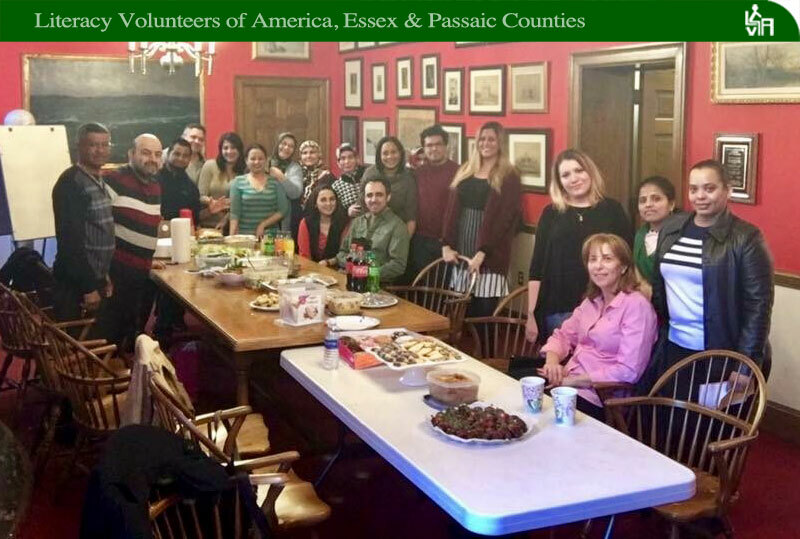 New classes began in those locations this month, as well as at Berkeley College in Newark, where three levels of ESL classes are offered for beginner, intermediate, and advanced students. Photos from our final days of classes are shown here. They were celebrated with emotional speeches from students and teachers, farewell embraces, laughter, and food – massive amounts of food - prepared by students and representative of local dishes from their native countries in Mexico, the Caribbean, Central and South America, Europe and Asia. 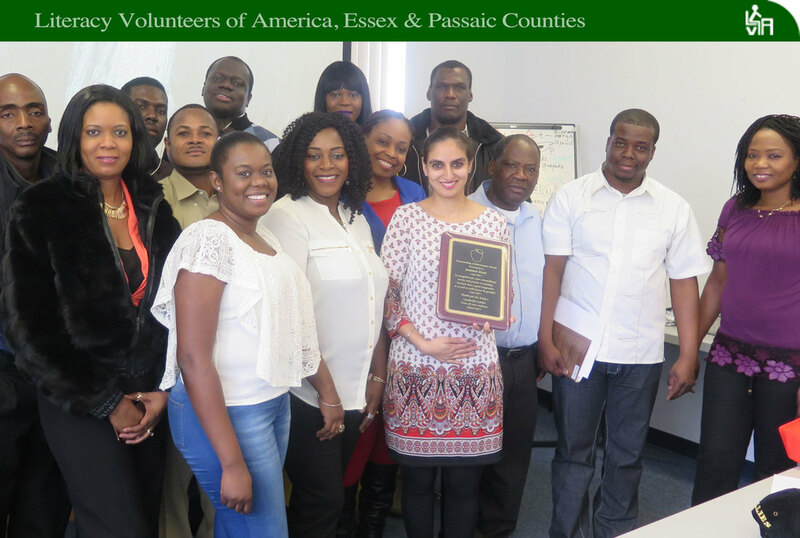 “We’ll miss you, our teacher Jasmeet Kaur, not only because of your personality, but also for your sense of humor and your good mood,” said student Charles Onaldor, from Haiti, as he presented Jasmeet Kaur, his teacher at the Hilton Branch library, with a plaque on behalf of the class.